Chillers play a critical role in the operation of commercial and industrial buildings, ensuring that your working environment is kept healthy and conducive to productivity. However, they require regular maintenance to ensure efficient and effective operation. If maintenance is neglected, you may find yourself in a position where your system unexpectedly breaks down or needs to be replaced more quickly than is desirable. In either situation, you need a reliable commerical HVAC company to help repair, replace, or maintain your systems. At AccuTemp Mechanical, we are here to help your Wisconsin or Northern Illinois businesses with all of your chiller needs—whether you want to sign up for a preventative maintenance plan or you need a chiller replaced fast. We put our customers first, and understand that in a commercial environment you need repairs and replacements quickly in order to operate your business. Need chiller replacement, repair, or maintenance in Wisconsin or Northern Illinois? Contact AccuTemp Mechanical online or by phone at 262-671-4012! If your building’s chillers are old and outdated or have not been properly maintained through the years, you may require chiller replacement. AccuTemp Mechanical is here to help all types of commercial and industrial properties in the Wisconsin and Northern Illinois area, including data centers, manufacturing facilities, food processing plants, and more. If your industrial chiller needs to be replaced, we’re here for you! Don’t see the type of chiller you need replaced in your WI or Northern IL business? Call us today at 262-671-4012 to learn more about our services, and we can see what we can do to accomdate your business needs. Did you know that building chillers are often the single largest use of electricity in a facility? Regular chiller maintenance is not only necessary to keeping them running smoothly and efficiently—but it can also result in significant cost savings for your business. In fact, maintenance is so important for chillers that certain tasks should be performed daily, weekly, monthly, and annually. Due to their high energy use, even if maintenance results in only small increases in efficiency, it can have a major impact in savings for your Wisconsin or Northern Illinois facility. Keep in mind that these are just some of the maintenance tasks we perform on commercial and industrial chillers. Our technicians will check many more components to ensure the most efficient operation and keep your unit running at peak performance. This visit will also give us the opportunity to identify any issues requiring repairs and make recommendations as to the best course of action if there is a problem. Want to set up a custom preventative maintenance plan with us? Contact us today to learn more and schedule your first maintenance visit! 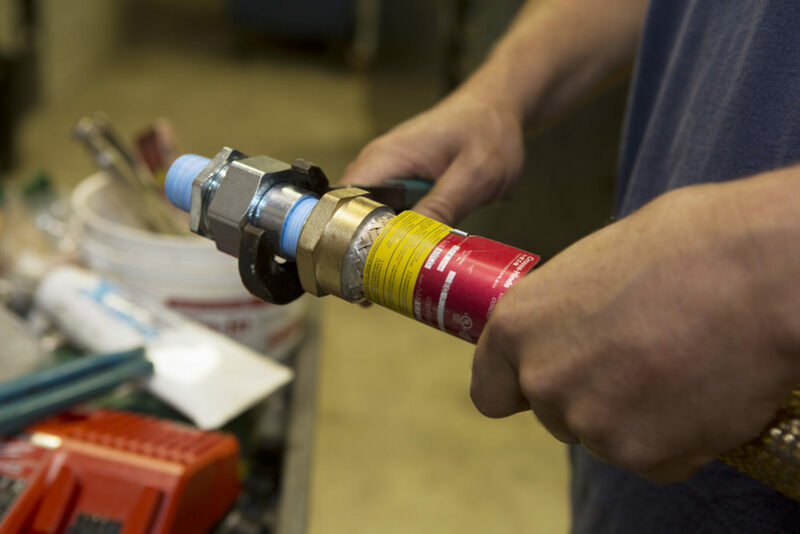 If your maintenance staff does notice an issue requiring repair during your routine maintenance visit or notices a problem during day-to-day operation, we can provide you with the chiller repair you need. We offer economical solutions to chiller issues for our commercial and industrial clients throughout Wisconsin and Northern Illinois, including 24/7 emergency service. Our goal is to help you minimize your company’s downtime with efficient and effective chiller repair services. If you need fast, reliable commerial or industrial chiller repair, contact AccuTemp Mechanical now at 262-671-4012! When you need commercial or industrial chiller replacement, maintenance, or repair in the Wisconsin and Northern Illinois area, contact AccuTemp Mechanical. We have been serving data centers, hospitality facilities, manufacturing facilities, and many other buildings in Wisconsin and Northern Illinois since 1973, and we send out fully trained and certified professionals to perform all work. To learn more about our chiller services or schedule your replacement or maintenance project today, fill out an online contact form directly from our website or give us a call at 262-671-4012.